During the period of national organization after independence from Spain, many families had to make a difficult decision: support a Confederation of provinces or a Buenos Aires-based government. Escalating into civil war, factions split between Urquiza & Rosas… in fact, many people on both sides are buried in Recoleta Cemetery & this blog dedicates a lot of text to this period. Based in the province of Entre Ríos & firm Urquiza supporters, the Andrade family was forced to leave Argentina. 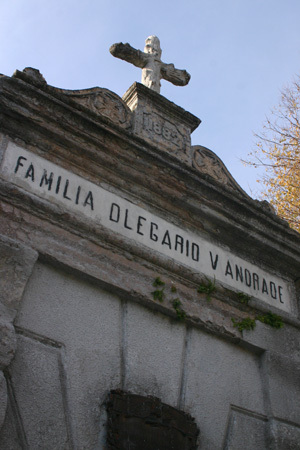 They made their way to neighboring Brazil where Olegario Víctor Andrade was born in 1839. After the 1853 defeat of Rosas, his family returned to Argentina & settled in the riverside town of Gualeguaychú. Olegario finished his early studies in the nearby town of Concepción del Uruguay & became friends with a future President Julio Argentino Roca… as well as with others who would go on to become important national leaders such as Victorino de la Plaza & Eduardo Wilde. Olegario demonstrated a gift for writing poetry even at this early age, often writing about national events. Although he worked in journalism at first, he eventually moved into provincial politics. In 1859 at the age of 21, Andrade became personal secretary for President Santiago Derqui & put his pen to good use in criticizing Bartolomé Mitre & the War of the Triple Alliance. El seguro camino de la historia! The sure path of history!